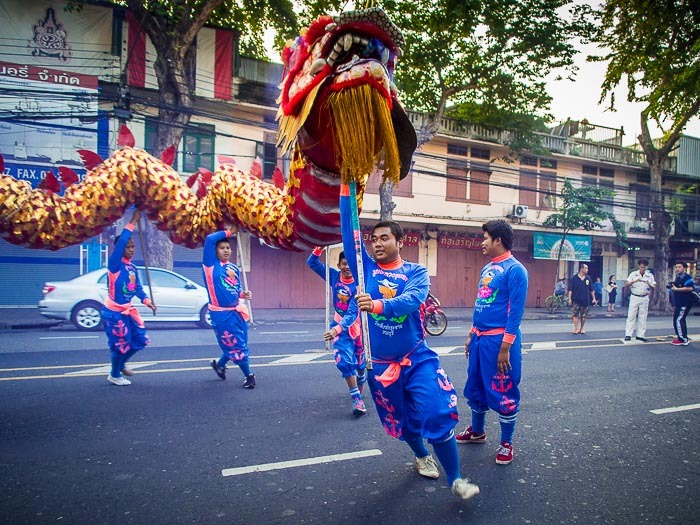 A Chinese dragon dance troupe performs during the Wat Saket temple fair parade Thursday. 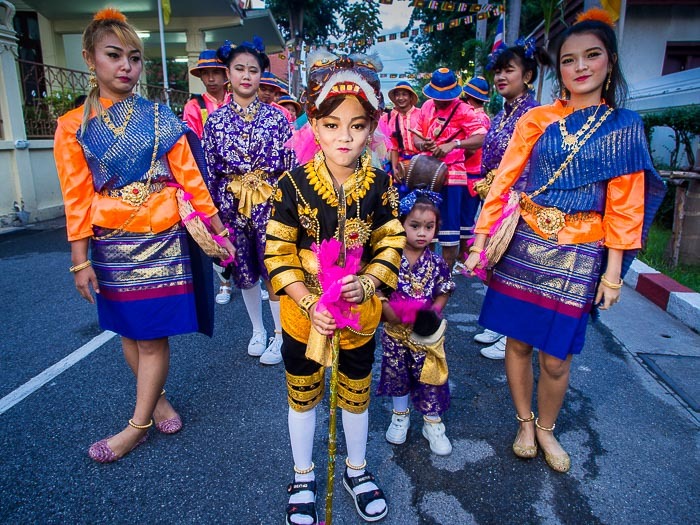 The Wat Saket temple fair is one of the oldest and most popular temple fairs in Bangkok. Thai temple fairs are bit like American county fairs, there are rides, games, food and entertainment acts. They're a chance for people in the neighborhood to come out and have a relatively inexpensive good time. The Wat Saket fair is a favorite of mine. I try to go a couple of times every year, but this year I'm going to miss it because I'm traveling. The parade to open the fair was at a ridiculously early hour this morning. I dragged myself out of bed and went down to the temple to cover the parade. Dancers line up before sunrise for the parade. It was not a parade in the US sense of the word. There were no floats or marching animals. It was more like a religious procession. Most of the entertainment was either cultural, like traditional dancers, or religious, like the lion and dragon dances. It wasn't all culture and religion though, a high school marching band, playing songs from the Broadway show "The Music Man" led the parade. People carried a very long bolt of red cloth during the parade. The cloth was carried to the top of the temple (the chedi for Wat Saket is about 300 feet above the city - it used to be the highest point in Bangkok) and then wrapped around the chedi. 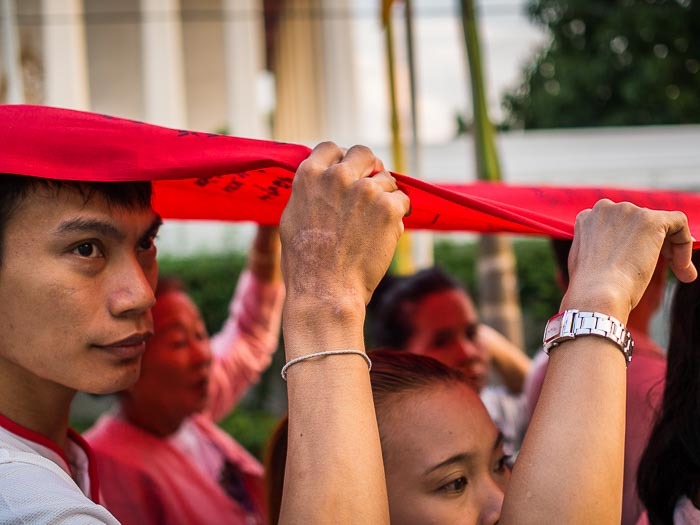 Buddhist faithful carry the bolt of red cloth around the chedi. People wrote prayers and wishes on the cloth before it was wrapped around the chedi. The parade was about 3.5 - 4 kilometers long, it basically circled the temple on the main city streets in the neighborhood but it felt exceptionally hot and humid in Bangkok this morning. Performers were not nearly as energetic at the end of the parade as they were at the beginning. 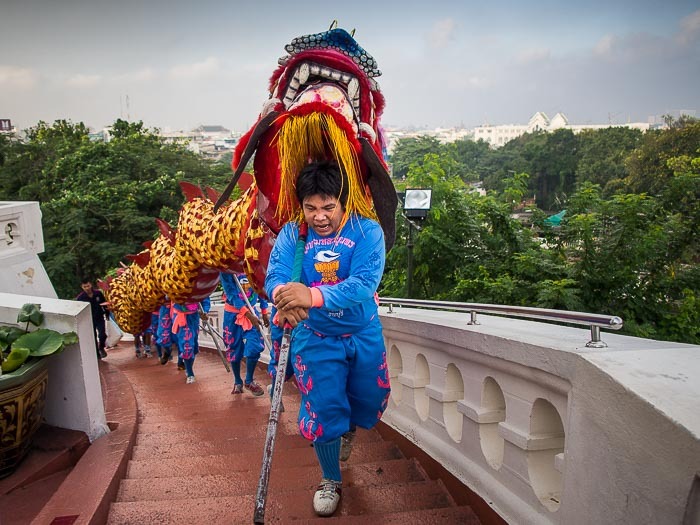 Dragon dancers climb the steps to the top of the chedi. 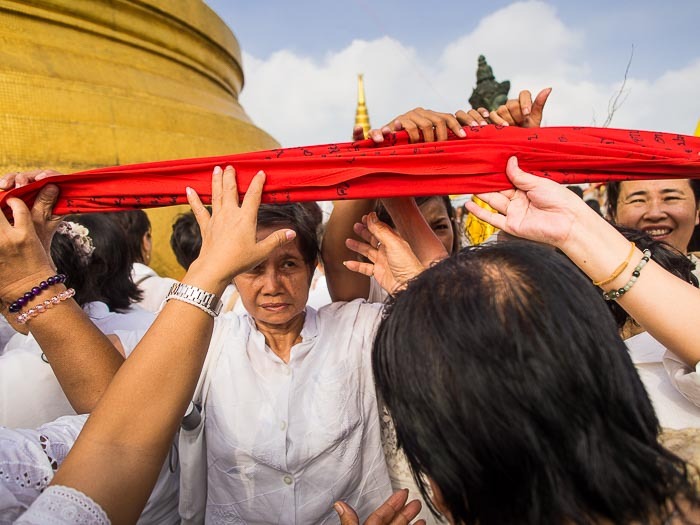 At the top of the chedi, people gathered for prayers while Brahmin priests led the procession of red cloth around the chedi. 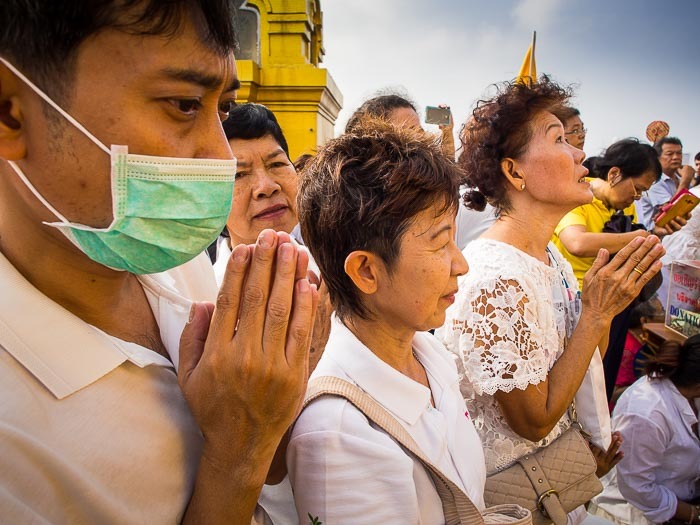 Buddhist monks chanted while people prayed quietly. People pray at the top of the chedi. There are more photos from the procession in my archive or available from ZUMA Press.